Exciting news! TOTAL Power of ONE in America is back in print and available. Up front is its new 56-page Book-in-Brief—a “quick read,” also a stand-alone volume. It includes the introduction, all 26 half-page summaries for book content, flavor and flow, and the “happy ending” last chapter. “A creative minority can reorder a society,” concluded 1977 Nobel Prize-winning scientist Dr. Ilya Prigogine, in his “theory of dissipative structures.” Applying, that means to get this country on a new path of positive change will require seven or eight percent of America’s 285 million people to make the difference. Hence, my goal, and hopefully yours, is, through people, business, organizations and associations, to get 20 million copies out in 3 years. On most of 629 talk shows with the book I have said, “Taxation, regulation and litigation are the strangulation of the nation.” Solution: Education. Also, “Illiteracy is the inability to read, write, think, analyze and articulate words, thoughts and ideas.” There is a lot of that going around. Some have said as much as 37% of our population are functionally illiterate. education story,” the one book to own when you own only one. TOTAL Power is an education Call to Action to individuals, and business and professional communities, to get and widely distribute this learning, teaching, training, reference, resource and unique learning system. Handy for book reviews, this book information file on disk is to help you and other concerned Americans know and “spread the word” about what is really going on and what to do about it, through knowledge, information, motivation and action. Like a website, find and review the Disk File Table of Contents, two pages following, then go where you want to go, to see what you want to see. Though copyrighted, you are encouraged to duplicate and distribute this disk as-is. It is a quick, effective, inexpensive way to share profoundly important information. Please note Items 19 and 20, Disk File Table of Contents, for two full chapters from the book. Important Technical Note: When you review the Table of Contents and know the page you want to see, go there quick and easy in one of two ways. Click on “Edit,” Then “Go to …,” select “Page,” enter page number, hit “Enter” then “Close.” Or, Likewise click on the lower right hand corner, small button between up and down arrows, “à”. Important situations, valuable information and needed inspiration are sent to great advice columnists, “Dear Ann Landers” and “Dear Abby.” We begin with just that, next page. Happy TOTAL Power of ONE in America life changes to you and all whose lives you touch. Some 135 million workers and 68 million students (95 million probably your readers) have lived, experienced, and paid dearly for this educational void. So have our economic and political system, standard-of-living and quality-of life. TOTAL Power provides the education way out. It will take 20 million copies in three years to provide people the information and inspiration for needed change. To save your valuable time I enclose its up front 64-page Book-in-Brief for a quick, descriptive book overview. Just ask, and I will happily send you the complete book. If Epictetus’ famous five words, “only the educated are free” are true, Americans are not free, but in the grip of 1983’s “A Nation at Risk.” Still true, it characterized America’s seriously flawed education system as “a rising tide of mediocrity.” We get subjects and courses but not education. The missing gaps are essential, what I call “The 8-Ball Eight perilous illiteracies”: economic, business, political, financial, governmental, constitutional, moral and citizenship. These gaps are bridged in one 608-page, hardcover book, TOTAL Power of ONE in America. The 135 million workers outside the education system and 68 million students within can now fill these gaps. More information, see www.TotalPowerOfOne.com. For under one hour’s credit, $29.95, your readers can get this real “rest of the education story” from Denver’s Tattered Cover Book Store, toll free, 1/800/833-9327. Thanks for your continuing service to your readers. This first-and-only “trailblazer” book puts between two covers everything you need to know to be a powerful person and citizen. With “The Great American Book” you will be more “healthy, wealthy and wise,” better know and understand America’s economic, business, political and government system, and how to have a richer life by making a powerful, positive difference within it. For the busy reader, the unique Book-in-Brief, with introduction, chapter summaries and happy ending last chapter, allows the reader to “customize” the book. You get its content, flavor and flow in about an hour. Choose where to go next for your personal discovery and growth. Each chapter stands alone. for a more prosperous and free economic system. With all this “wise,” you get “healthy and wealthy” with personal wellness and financial independence. To share new understanding, you learn how to influence one more person, then many more. Finally, your TOTAL POWER becomes perpetual power with “happy ending” motivation and inspiration. Holden erases economic ignorance, lifestyle ineptness, political gullibility, complacency and apathy. He gives the gift of knowledge, leading to understanding and undreamed-of PERSONAL POWER, as America’s future prepares for your TOTAL POWER OF ONE IN AMERICA! FRED HOLDEN was Director of Economic Affairs for five of 15 years at Adolph Coors Company, leading their award-winning economic awareness program for employees, teaching Coors employees and others economics. He has 41 years business experience, 26 in the big corporation, with technical and MBA degrees. His Phoenix Enterprises provides public policy analysis and citizen education. He wants to getthe goodness of business and business people to engage America’s youth in the classroom.Through his business-as-teacher consortium for economic awareness—The education solution. A new burst of freedom—he wants TOTAL Power of ONE in America in 20 million citizen hands, heads and hearts. He was on Denver’s Rocky Mountain News Board of Economists and Senior Fellow-Budget Policy at Colorado’s Independence Institute for five years. Guest on over 620 talk shows, published and spoken widely, Holden is listed in Who’s Who in the World, Who’s Who in America, and Heritage Foundation’s Annual Guide to Public Policy Experts (since 1987), in US government spending and taxation, state and local public finance and economic education. For 15 years he was a member of National Speakers Association and National Association of Business Economists. Did you learn all you needed to know? ONE in America is truly a masterpiece. Timely for America’s challenges, and timeless in its application of eternal truths. It will grab you, move you, and just possibly change you forever. P. O. Box 1900, Arvada, CO 80001. Although the author and publisher have made every effort to ensure the accuracy and completeness of information contained in this book, we assume no responsibility for errors, inaccuracies, omissions, or any inconsistency herein. Any slights of people, places or organizations are unintentional. The following trademarks appear in this book: Total Power of One in America, plus the symbol of 1 in the United States. This edition is an expansion and revision of the first edition of Total Power of One in America published by Phoenix Enterprises, copyright © 1991 by Fred Holden. 1. United States-Politics and government. 2. Economics-United States. 3. Business. 4. Citizenship-United States. 5. Finance, Personal. 6. Conduct of life. 7. Self-care, Health. I. Title. ATTENTION CORPORATIONS, ASSOCIATIONS, UNIVERSITIES, SCHOOLS, AND PROFESSIONAL ORGANIZATIONS: Quantity discounts are available on bulk purchases of this book for educational purposes or fund raising. Special books or book excerpts can so be created to fit specific needs. For information, please contact Special Sales, Phoenix Enterprises, P. O. Box 1900, Arvada, CO 80001, or call (303) 421-7619. Self-Image: The time is now. About 40 years ago Dr. Maxwell Maltz, a plastic surgeon, popularized the term “self-image.” He did this with his teaching and his two books, The Power of Self-Image Psychology and Psycho-Cybernetics. Among other observations and facts, Dr. Maltz taught: (1) People want the positive respect of others. (2) Doctors and dentists can help most people enrich their lives. (3) Some people, because of imbedded negativism, block themselves from accepting the more promising realities of their lives. (4) Improved appearance does not always bring about an improved self-image. (5) Doctors must always communicate hope. (6) Hope is a process of envisioning a goal, achieving and moving on to achieve another goal. (7) The happiest people are those who achieve to help others. (8) America has become a great country because so many of its people have been free to live the hope/achievement process. Most of a person’s self-image is invisible. It reflects subjectively how a child or adult interprets his/her relationships to God, family, play, work, societal groups within which one lives, including one’s economic/political system. America’s self-image is made from the millions and millions of ways its citizens have lived the hope process. America’s legacy is made up of the history and fundamental principles that have enabled hope to be translated into realities. In spite of our monumental rich legacy U. S. citizen’s recognition and understanding of it is dimming. Sadly, for many citizens the dynamic building blocks of America’s self-image legacy are no longer visible. This void in U. S. human understanding and potential has been brought about by disinformation, poor schooling and neglect of America’s older generation. Only through participative education processes such as Fred Holden’s Total Power of One can the continuity of America’s self-image legacy be assured for future generations. As a member of the 10th Mountain Division during World War II, I am not proud to say our generation, recently called “the greatest generation,” has not been very effectively involved in the two century long war of ideas, which is decimating the world today. American children are 28% of our population...and 100% of our future. The youth of America are well meaning and energetic. Their potenial is boundless. However, they face many negative, hope-destroying influences that children in this country never before had to face. My friend Fred Holden is an engineer with a Masters in Business; he became director of a Fortune-500 company’s employee economic awareness program. Receiving new, different information convinced him he’d not learned much of importance from his education and 20 years corporate experience. He devoted five years to learn, teach and “speak economics” and a lot more. He left the corporate world to launch a new education adventure, TOTAL Power of ONE in America, called by some “the only other book you need.” This book will help bring back a strong American self-image. Holden says, “Illiteracy is the inability to read, write, think, analyze, and articulate thoughts and ideas.” He lists the “unlucky-7 dangerous illiteracies” as economic, political, business, constitutional, governmental, moral and citizenship.” TOTAL Power, the real “rest of the education story,” fills these gaps. On some 625 talk shows, he has challenged listeners. The attractive 608-page hardbound Total Power of One is more than a book. With the small 56-page quick read (1-hour) summary Book-in-Brief, it is a self-learning and teaching system. People of all walks of life, familes, individuals, businesses and health professionals can benefit. I have purchased books for all RMO U. S. and international subsidiary people. I have shared what I have discovered. Why not get involved with a little reading and sharing. American’s brighter future depends on you. You will already have assigned to others. Do you know: (1) The Congress is the most powerful and important of the three branches of our government. (2) Only Congress can declare war. (3) By intent of the founders, through the power of the purse string, the power of impeachment, and the power to limit judicial fiat, they have the power to rein in runaway judicial and executive branches of the government. I still had many serious gaps and misunderstandings. TOTAL Power of ONE in America filled every one of them. the best speakers. TOTAL Power of ONE In America beats them all. ... and from now on. Has the hope of America’s second president John Adams been lost in our busy-ness of business? In his fight for nationhood in Broadway’s historically accurate musical 1776, John Adams was obnoxious, disliked, and misunderstood ... but optimistic, and full of hope. His steadfast fight for American “Independency” paved the way for the life we enjoy today. So much has changed. Crusaders like Adams, who sacrificed so much for our freedoms, are unheard-of in the growing obesity of today’s political system. With talk of the Electoral College, “chads” and bureaucracy running rampant, one person is too small, too insignificant, to change a nation. Ask Fred Holden, author of TOTAL Power of ONE in America, who still holds the spirit of John Adams alive—more than two centuries later. Holden views the challenges facing our nation with optimism, great faith and hope. Like Adams he has dedicated himself to helping others recognize and embrace their tremendous personal, professional and political power. TOTAL Power of ONE in America combines Holden’s passion, Adams’ spirit, Washington’s selfless service, and the knowledge and information needed to develop the personal power for one person to make a difference. Between its covers is everything you should have been taught in school. An in-depth guide to business, economics, politics, and US government, it includes chapters to round out the fully empowered individual – lifetime personal finance, personal WELLNESS, and how to inspire others to set forth on their own BIGGER THAN LIFE, Power of ONE journey. This newly-updated edition (original edition published in 1991) begins with the Book-in-Brief, a convenient compilation of chapter summaries to give the reader a quick overview to instantly increase their personal power. Your owning, use and sharing of TOTAL Power of ONE in America could help spread Adams’ hope for a newborn nation. Will you catch on to Holden’s optimism that The Power of One can keep freedom in fruition, and positively change the course of our nation so precious? PS – Thomas Jefferson said “If the people don’t have enough information to wield power correctly, don’t take the power from them. Give them the information.” HOLDEN DOES. What could you make happen with the powerful information found in this book? Author Fred Holden’s life precepts are: knowledge is power, information is empowering and learning is life. He is a lifelong learner, avid reader and enthusiastic seeker of truth. Running a Fortune-500 company’s employee economic awareness program, Holden got five precious years to learn, teach and “speak economics” and a whole lot more, all over America. When his boss and mentor died, he vowed to write it all down, and did, in TOTAL Power of ONE in America. Subtitled, “Discover What You Need to Know, Why and How to be a More Powerful Person and Citizen. The book’s scope and immensity proved to be a wide, wide look at life, particularly in America. What is an economic system? How does it work? What is the role of freedom? How do business, profit, character and the world of work fit into it? This manual of life and textbook of American business, economics, politics, and government is so much more. It presents the unifying empowerment of economics; intuitive power of history; personal power of business, hard work and finance; citizen power of politics, and of very personal power — mental, physical, emotional, spiritual. “Illiteracy,” says Holden, “is the inability to read, write, think, analyze and articulate thoughts and ideas,” listing the “unlucky-7 dangerous illiteracies”: Business, economics, politics, government, constitution, moral and citizenship—gaps this book fills. TOTAL Power of ONE in America features The Book-in-Brief up front, a summary that gives the content, flavor and flow of the book in 56-pages, an hour or so “quick read”. TOTAL Power of ONE in America is the only other book you need. It shows one person can make a difference, must and here’s how. Holden asks, “What if they’ve got the power and you don’t?” and conversely, “What if you’ve got the power and they don’t?” Then he tells what that power is, how to get it and how to use it. Holden shows in many ways how you can put more focus, balance, control and quality in your life through knowledge, information, motivation and effective, continuing action. Isn’t TOTAL Power of ONE in America the book for you, now? reservations whatsoever ... especially recommend it for high school students ... should be mandatory reading ... written at an appropriate level ... would be a very favorable fit into the curriculum and has direct applications for subjects such as social studies, civics, American history, business, economics, politics, government, character, and ethics ... our education system needs a comprehensive, credible, well-researched and documented "rest-of-the-story" of how all we teach fits together. Holden's book does just that and more. ... used this book for the past several years in the eleventh and twelfth grade levels and find that the principles taught therein are excellent in both areas of economics and limited Constitutional government. ... May I recommend that private, Christian, and public schools review it with the possibility of incorporating it into their educational programs? ... my overall impression is that Fred’s purpose in writing Total Power of One in America is to empower the readers by giving them knowledge, along with encouragement to use this knowledge to understand and improve their lives. ... My greatest revelation was that possession of the knowledge it had to offer gave me power. ... as important as it is for me to realize my power, it is just as important to share this knowledge with my children and others so that this power can be multiplied as others get involved. ... I am having my children read the sections of the book that have the most impact on their lives at this point, so that they won’t have to wait until they are adults to learn the things I have just learned. I was glad to have invested the time it took to read Total Power of One in America. I know anyone who reads this book will benefit from it in the same way and I highly recommend it. "A Freedom Feast for the Mind"
Freedom has always been a fight worth fighting. The fight is already on. The challenge for freedom fighters is to start somewhere. It must begin with the individual, the "One"—the TOTAL Power of ONE in America. Centuries of history have taught free people what journalist Paul Harvey says so well, "Self-government without self-discipline is self-limiting and self-defeating." Sadly, few Americans know what this means or if it applies to them. How could the people know when our "leaders" and educators do not teach them? It is time Americans learn how. Fred Holden gives the American people renewed "Power"—TOTAL Power of ONE in America! Holden says, "Our system of education teaches just about everything except the three things that matter most—How to make a living, how to live, and how to understand life, especially in the areas of economics and politics." The secrets to citizen empowerment are now exposed in this 600-page American owner's manual of information and inspiration. Why would a corporate executive leave a cushy career to invest five years of sweat and tens of thousands of his own dollars to write "the Great American Un-Novel?" "I was giving a speech," he says, "and as a joke I started out by telling my audience, 'You don't matter. You can't make a difference.' And about two thirds of the people were nodding in agreement. I thought, this is terrible. I'm kidding and they're nodding." Holden believes today's political apathy, born out of a conviction of powerlessness, is a challenge so serious that it jeopardizes the foundations of America's freedoms and the future opportunities of our children. "People want to make a difference," he says, "but they don't know how to get started. Parents and teachers don't have the information so children don't get it and everyone is ignorant and powerless. We have never been taught how to be American citizens." Until now. TOTAL Power of ONE in America is a 26-course gourmet meal for the mind. Chapters 1 to 4 tantalize your mental appetite with a taste of freedom, the Power of ONE philosophy for living, the empowering Bill of Rights, and how to give today's youth hope for the future. Wash that down with chapters 5 through 11 as you learn economics, free enterprise, character, business, profit, employment strategies, and starting an economic awareness program. The meat of the feast is found in Chapters 12 to 21, where you will seek the truth in learning and ideas, positive activation in politics, discovering our exciting Freedom Documents, economic and political systems and leading our government to a properly efficient size. A side salad of nutritional value fills you with personal financial planning and the Triangle-plus Approach to personal wellness, in Chapters 22 and 23. The meal is finished off in the final three chapters with a motivating dessert of how to join with others on your joyful journey, and your new extraordinary mission of freedom and hope for you, a new Power of ONE. The table is set and is waiting for you to sit down, partake, and share. Self-discipline comes out of knowing and then playing by the rules of the game. God and our Founding Fathers gave us (U.S.) great guidelines to live and grow in. Most of those principles are now all in "One" book. Thomas Jefferson gave us a solution for a lack of self-discipline, "If the people don't have enough information to wield power correctly, don't take the power from them, give them the information!" The future of freedom is at stake and here is the information Americans need to secure it. "Through his book, Total Power of ONE in America, Fred Holden encouraged me to try extraordinary things to impact society. It is my belief that, along with the Bible, this book should be on the book shelf of every American citizen, especially every home educator. And I make this challenge that you can't read the last chapter (after reading the rest of the book) without getting a tear of hope and a powerful boost to go out and be a TOTAL Power of ONE in America." 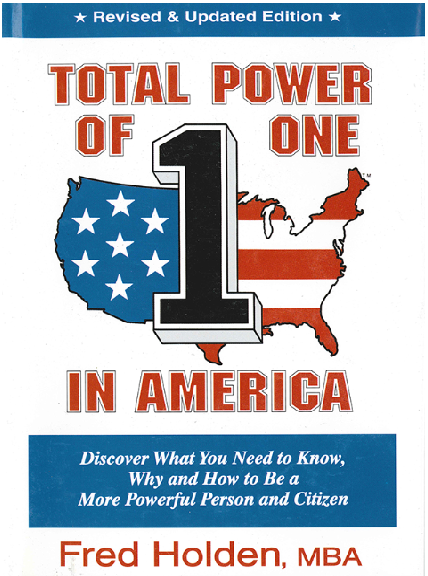 “I’m pleased to inform you that TOTAL POWER OF ONE IN AMERICA is featured in the May issue of our library newsletter “Wisconsin Bookwatch” on page 11, column 3. This review also appears in the May issue of our book, music, video and software review magazine “Internet Bookwatch”; and forwarded to Gale Research Company’s interactive CD-ROM series “Book Review Index” (published four times year for academic, corporate, and public library systems). This review will be posted for five months on our web site at http://www.execpc.com/~mbr/bookwatch/ibw. I am Ruby Wyatt, retired Consumer and Family Studies (“Home Economics”) teacher of 29 years in Colorado’s Jefferson County Public Schools, 28 at Arvada High School. I am now a Long-Term-Care insurance specialist and educator representing Krieger & Associates, Inc. I chose to teach Home Economics because I thought it to be the best course possible to present true education to my students. Home Economics brings together many other courses, required and elective, to give more meaning, importance, relevance and perspective to my students. To offer variety, substance and enhancement I often drafted outside speakers. Three times Mr. Fred Holden presented to my classes important, but not readily-available, information, some not deemed popular. Topics included economics, free enterprise, work and the world of work, America’s freedom documents, American government, business, economic and political systems. Fred presented in a practical, easily understood, student-friendly style. Fred has addressed many such classes. I brought Fred in to give a perspective on politics, government’s role in people’s lives, the growth and impact of government, taxes and the laws. I emphasized that students become more involved in community activities, seconded by Holden. He explained how to accomplish this. Each must make some kind of impact on one’s community, state and nation. That is the power of Total Power of One in America. Between the covers of his book is included virtually everything else I believe high school students need to truly round out their education and to make the curriculum powerful. Book construction and design are educationally beautiful: Preview—read—review—test—apply. For a fast start it provides an up front learning overview; 56-page Book-in-Brief, with the introduction, 26 half-page summaries and “happy ending” last chapter for book content, flavor and flow. It has 26 stand-alone chapters with details, each ending with 10 study questions, then appropriate quotes. The content is even more amazing, squeezing in so many vitally important concepts that touch the lives of teenagers and adults alike. Fred did it. He begins with the concept of freedom. In fact an early quote attributed to Epictetus summarizes the whole point: Only the educated are free. My sentiments exactly. Poetically he states the obvious, “The two obstacles to learning are not to learn and not to be taught. The first is under your control, the second is not.” You can’t teach what you don’t know, or is not available. Fred has gathered and reveals vital hard-to-find information. I pictured my job as helping each student to see their special place, accomplishing what they want, making and meeting goals; each individual making a statement—something in mind for their lives. Each student can make a difference. TOTAL Power tells how. This book is what’s needed for today’s demanding times. I highly recommend it for students of all ages. From this seasoned teacher who’s been in the trenches, get Total Power of One in America. “Total Power of One in America” by Fred Holden is the best book I know. That’s the most important thing I can express from my extensive experience. It is the most powerful, purposeful, practical and readily understandable book on self-fulfillment I have ever read. Your instructions for studying it systematically are unique, will guarantee rapid realization of the results it sets forth, and insure the productive content will promptly penetrate into the permanent body of profitable knowledge. What are my qualifications to make this evaluation? Now 90 years old, I have been involved in the education of employed adults for 65 years in 47 states and on five continents. I met Dale Carnegie in l936 when his phenomenal, perennial bestseller, "How to Win Friends and Influence People" was published. I was professionally associated with Doctor Maxwell Maltz, author of "PsychoCybernetics," which explores the root of so many people’s self-image problems. As a founding member of the National Speakers' Association in 1973 and now its senior member, I can say this book is without doubt the most valuable and effective self-improvement book ever. In my 90 years I have read the best books and heard the best speakers. "Total Power of One in America" beats them all. Reading your chapter 17, “Discovering the Reading Documents,” for instance, leads directly to my most recent work, "The Constitution of the United States in Modern English." This "Handbook to the American Dream" is about to be listed on Amazon.com in English and Spanish. My two best-selling books on memory improvement have been published in both English and Spanish. As a lifelong learning and memory specialist I was impressed by your directions to read the summary of each chapter before reading the chapter, then again after*. I cannot stress too much the importance of those steps, to give the mind a meaningful framework on which to build the structure of knowledge. It develops a memory blueprint to give a firmer understanding of the meaning of the text. Making it more memorable, it’s somewhat like building a house. You get the frame up, then discuss how to furnish the various rooms. I unequivocally and enthusiastically recommend that each person, member of a family, worker, business manager or owner, community leader and public official will benefit immeasurably by reading, applying and sharing with others the book and concepts therein. Today we need leaders and followers with clear thinking who take action, especially in the political arena. "Total Power of One in America" should get them there, put them to good work and assure a brighter future for our people and those to come. Congratulations on a great work. I hope you garner support and truly "get out" the targeted 20 million copies in three years you have set for those who truly understand the needs and possibilities of America's future. This book is a beautiful gift to America, its people and brighter future. *I have used this method in training hundreds of students to become experts on the Constitution and Declaration of Independence. I first put original texts into Modern English and gave them memory patterns by which they could grasp the meaning of the documents. Teachers and Constitutional experts then added to the basic knowledge. There are many lawyers in Texas who started with my instructions. About one hundred students became excellent public presenters of the Constitution, and traveled widely explaining it. One in the 1987 group became clerk to Chief Justice Rehnquist in 1997. The Constitution program grew out of a program for students sponsored by the Free Enterprise Institute, of Houston, Texas. Students studied the ten principles, and became expert and sought-after public speakers on the subject. and price it took for our founders and fighters to achieve this. obtain water-safety and first aid skills. essence, the future of our great nation. you, but especially recommend it for high school students. economics, politics, government, character, and ethics. questions, pp 220-222, then making that big commitment to oneself on p 223.
then present, with these questions answered personally as goals and guides? and spirit. With the "healthy and wealthy" there's a lot of "wise". but especially for instructional application. the schools, junior high (or middle) school and high school? result to get the book in schools. When I fought overseas during World War II, my “home” was an L.S.T.—“Landing Ship Tank” (and other such names as Large Slow Target or Last Stop Tokyo). It was a beautiful, cumbersome, secret war machine that carried tanks, cannon, smaller personnel carriers and scared, brave, young soldiers. The movie, Saving Private Ryan showed how we fought and lived while many of my comrades-in-arms died—for something called FREEDOM in America. If they could view today’s mess of citizen ignorance and voter apathy, of establishment power, government growth and politicized issues, of diminished freedoms, increased taxes, oppressive regulations and thwarted liberties, you would begin to understand my longing for vindication for their sacrifices made and lives lost. A vanishing breed of heroes, a thousand World War II veterans die every day—these who inspired Tom Brokaw’s book tribute, The Greatest Generation. As curator of the L.S.T. Brothers Library and Museum, I seek to preserve from long past to far into the future, the memory of those heroic Americans. Today’s more desperate need is for the memory of freedom to be more than a memory, to reclaim the freedoms and rights we once had and have been slowly but surely losing. We are becoming a collectivist, statist nation, adopting a socialist preference in our ways of doing business, government and life. That’s not the Success Formula of the Founders, not how our freedom documents—Declaration of Independence and U. S. Constitution, with its incredibly important Bill of Rights—were designed to work. That’s what we’re losing. With our inept media, public officials and education today I thought we had lost it forever. But no more. I found a remarkable and comprehensive book— TOTAL Power of ONE in America by Fred Holden—that will help bring America back, perhaps in my lifetime. It contains virtually everything one needs to know to make a powerful, positive difference. Subtitled Discover What You Need to Know, Why and How to be a More Powerful Person and Citizen, it is a mini-encyclopedia of American business, economics, politics and government—what we should have been taught and were not, and what we so desperately need today. TOTAL Power contains knowledge and information leading to understanding and inspiration to make Americans and America whole once again. It covers the gamut of topics that each American can know to be powerful and effective citizens. Its Book-in-Brief gives a fast, marvelous overview of the book, then each stand-alone chapter gives the details. Holden wants to get this book to 20 million Americans in the next three years, to upgrade their civic savvy and sense of America’s heritage. I want to help him. I want you to help too. He has found a means to do it in the concept of a consortium—“an agreement, combination, or group (as of companies) formed to undertake an enterprise beyond the resources of any one member.” If each of us as individual, family or business entity, owns, reads and shares a book or two, case, or Custom Legacy Edition, this project becomes possible and promising. If you talk the talk, you must walk the walk. I got much more than a Custom Legacy Edition because of the importance and urgency I feel for this mission. I want it to happen and in a military sense, will accept no less than victory. I ask your help. For America’s freedoms and future will you also invest in a few books, case of 20, even a Custom Legacy Edition—to share your concern and create a lasting legacy? You will be magnanimous in your gifts, majestic in your efforts and make a needed and critical difference in America’s future. And you will honor the memory of my brave World War II brothers who fought so hard and sacrificed so much for this magnificent system and nation. Fred Holden is public policy specialist, speaker and author of TOTAL Power of ONE in America, available at Tattered Cover Book Store, 303-322-7727, 1/800/833-9327, or send $38 to: TOTAL Power, Box 1900, Arvada, CO 80001 (303-421-7619). Copyright © 2001 by Fred Holden. All rights reserved. I have enjoyed exercising at the weight room for a long time, because of the benefits of exercise, but also because I have come to know many people who are participants in a weight training class for seniors. They are the most faithful, encouraging, fun people I have ever met and we enjoy kidding each other as we work out. I only knew Fred Holden and his wife, Dottie, by their first names and had no idea that Fred was such an accomplished author until he told me about the publication of the revised edition of his book Total Power of One in America. I really did not know what the book was about, but Fred seemed to believe in it so strongly, I thought I would have everything to gain by reading it. Having read the book, my overall impression is that Fred’s purpose in writing Total Power of One in America is to empower the readers by giving them knowledge, along with encouragement to use this knowledge to understand and improve their lives. It has something to offer to everyone, no matter where you are in the progression of your life. I am married, a homemaker and mother of three teenagers, ages fourteen, sixteen, and eighteen. At this point, my biggest priority is my family and seeing that our children have what they need to live happy, productive, successful lives. Our children are beginning to enter the job market, become more independent, and are making decisions as to what kind of futures they hope to have. The ideas Holden presents in Total Power of One in America help explain how our government evolved, how it functions, and ways each of us can participate to take ownership of our lives, and find our own power as a citizen of America. When I began reading this book I decided to consider what I learned that I had never known or had not realized, even though I have a college degree in education and worked as a YMCA athletic director before having children. First, there was a reminder of the preciousness of our freedom in America, its tremendous cost to those who fought for it, and our obligation to protect it. Related to that was the idea that our freedom can be viewed on a scale which shows the less government control and taxation we have, the greater our degree of freedom. Also, although I had classes in American History, Government and Economics, I still had never understood the meaning of the “Freedom Documents” such as the Declaration of Independence, the Constitution, and the Bill of Rights. I am embarrassed to say that although I read about the national debt, deficit spending, and inflation, I did not know what these terms really meant, or how they impacted my life, or the futures of my children. Now I see the relationship between profit, business revenue, expense and income tax. I never knew America is a Republic, as opposed to Democracy, and the reason that distinction is so important to the way our government is run. Of course, I agreed with Fred’s “Triangle+ Approach to Personal Wellness,” which is another example of the way Fred encourages us to be the best we can be in all facets of our lives. I was amazed that I had not been aware of all that I did not know and all that I need to know to have power in my own life. My greatest revelation, after reading Total Power of One in America, was that possession of the knowledge it had to offer gave me power. By being involved in our government, at any level, I can exercise that power. For me, my involvement is with the schools and programs that affect my children and our family. But I notice now, that I take more interest in news reports dealing with the economy, taxation, the role of government on our lives, than I ever did before. I think this is because I understand more and I see that I have power to participate and not just be a bystander in the way government works and the effect it has on me and my family. Also, as important as it is for me to realize my power, it is just as important to share this knowledge with my children and others so that this power can be multiplied as others get involved. I was glad to have invested the time it took to read Total Power of One in America. Fred was right to believe in it so strongly and I know it has changed my life already. I am having my children read the sections of the book that have the most impact on their lives at this point, so that they won’t have to wait until they are adults to learn the things I have just learned. I know anyone who reads this book will benefit from it in the same way and I highly recommend it. "If the people lead, eventually the leaders will follow” is the spirit of TOTAL POWER OF ONE IN AMERICA, the citizen power manual of American government, economics, business and politics. It tells how one person armed with economics can make a difference to improve America’s future. But to me, it's much more than that. Holden illustrates the crimes his generation commits on my victim generation. We've been trained ignorant enough not to notice, much less take action. With this book there's no excuse for ignorance. These “Life Power Tools,” as Holden calls them, are combined to make TOTAL POWER OF ONE IN AMERICA a blockbuster book that produces power-packed people. Thomas Jefferson said if the people don’t have enough information to wield power correctly, don’t take the power from them; give them the information. TOTAL POWER does so, especially in politics. TOTAL POWER describes four political involvement levels—spectator, participant, enthusiastic, activist, the last divided into supportive, elective, appointive, and directive modes. Specific, effective citizen secrets use the 3 by 3 power letter—3 paragraphs, 3 sentences each, answered with the 3-part formula, “what, so what, now what,” then the magical “what next?” It tells the subtle but important difference between effective letters to an editor and to a public official. Holden says “Our system of education teaches just about everything except the three things that matter most — how to make a living, how to live and how to understand life, especially in the areas of economics and politics,” the challenge met in this 26-chapter, 608-page book. Like Starship Enterprise from television’s Star-Trek, TOTAL POWER OF ONE IN AMERICA, takes you beyond anywhere you've ever been before, beyond rhetoric and charisma, beyond political fluff, to a whole new world of reality. TOTAL POWER offers as an example the familiar but misunderstood phrase “political spectrum.” Used often in the media, Holden says “it’s not there”—in your dictionary, encyclopedia, or local library. That prompts two questions: Why isn’t it there? What else isn’t there? Subtitled Discover What You Need to Know, Why and How to be a More Powerful Person and Citizen, this new Citizen Weapon helps concerned Americans blast off to re-shape U.S. economic and political policy, through new knowledge, information, and motivation to get involved. TOTAL POWER OF ONE IN AMERICA reveals the two-part magic of KIMAX, the revelation—“You count, you matter, you make a difference,”—and the success formula: Knowledge, Information, Motivation, Action, eXcellence, and their powerful combination. Quite timely is the impact KIMAX will have on the local elections with their political parties, platforms, issues, candidates, primaries, conventions and finally, the national election. Gaining personal power sounds like a cliché and it is, requiring one to be “healthy, wealthy and wise.” It’s full of “wise,” but offers a chapter each on healthy, personal wellness—mental, emotional and physical fitness; and wealthy—lifetime financial planning for personal security and financial independence. Altogether, that’s peace of mind. TOTAL POWER OF ONE IN AMERICA is a Citizen Power Manual, a potent Citizen Weapon to help concerned citizens bring America back. Is this the only other book you need? Let the people lead, the leaders will follow -- or else. Watch out. (At that time) Tamilyn DePalma, a recent graduate of Colorado State University, is a professional writer and publicist who considers herself a TOTAL Power of ONE.